Idaho’s high technology industries had a difficult time during our most recent downturn and have yet to fully recover. 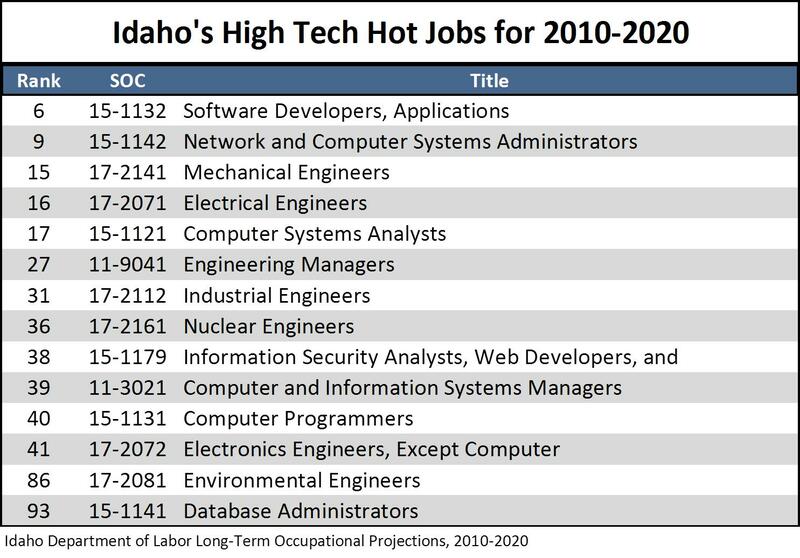 The Idaho Department of Labor’s latest Idaho High-Tech Business Scan, found Idaho ranked last among the surrounding states in high-tech employment growth between 2007 and 2012 with a 4.9 percent decline. This decline was great enough to land Idaho near the bottom of all states as well – just above New Jersey and Delaware. Before the recession, Idaho was doing much better. 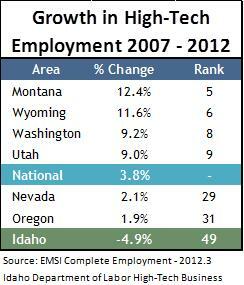 From 2002 and 2007 Idaho’s high-tech industries grew 11.4 percent. This still placed Idaho near the bottom among the border states, but the state was ranked above most in the nation at 16th. Four out of the six surrounding states landed in the top 10. Looking at Idaho regionally, the southwestern part of the state, unsurprisingly, has the majority of high-tech employment at 54 percent. However when looking at relative employment – high-tech employment as a percentage of all employment – eastern Idaho ranked first at 10.5 percent of its industry employment being in high-tech. Earnings are where this industry shines in Idaho. While earnings per worker of $73,864 in Idaho only ranked 39th in the nation, earnings per high-tech industry worker compared to earnings per worker in all industries, Idaho ranks near the top of the heap. With a ratio of 199.3 percent – or almost double the earnings per worker in other industries – Idaho is ranked fourth. High-tech occupations are well represented on the department’s 2010-2020 hot jobs list, which ranks jobs on their abundance in the economy, projected growth rate and pay. Occupations in high tech take up 14 of the top 100 spots, and all but two of them are in the top 50; application developer and system administrator occupations rank in the top 10. This entry was posted in Employers, Employment News and tagged employment, high-tech, idaho department of labor, jobs on May 15, 2013 by Idaho Department of Labor.